Tumbler Stainless Steel No 101. Material- Making in 100% Stainless Steel. 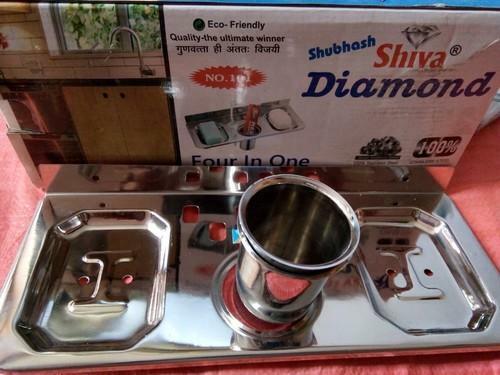 Leveraging on the proven experience of our team, we have established a strong foothold in the market as traders and suppliers of Bathroom Fittings. We offer our clients with a comprehensive range of Water Showers, Telephone Shower, Ceiling Shower, Bathroom Accessories etc. These are procured from reputed manufacturers who have a credible market position and are known for offering a qualitative range to their clients. Thus, with the support of our vendors and a proficient team, we have carved a niche for ourselves in this industry. We are also known for our client-centric approach, which enables us to cater our clients with fittings as per their preferences. Our team coordinates with the clients to understand their requirement for a specific design in Bathroom Fittings and offers them a customized solution with the help of our vendors. Further, we also offer our clients with easy payment options and timely deliveries to provide convenient business transaction. Thus, we have gained tremendous faith of our clients and garnered a huge clientele across the country.